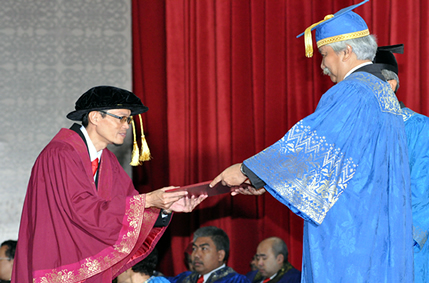 BANGI, 20 Oct 2012 – The Faculty of Science and Technology of The National University of Malaysia (UKM)with1493 graduandsform the largest number of graduating students this year. Statistics made available for the 40th Convocation of the university beginning today showed the Faculty of Social Sciences and Humanities, with 1,021 graduads in second place followed by 987 from the Faculty of Islamic Studies. This time there were more graduates scoring outstanding results compared to last year. The Faculty of Science and Technology recorded 56 outstanding graduads compared to 45 last year. Islamic Studies produced 42 against 40 while the Faculty of Economics and Management had 32 one more than last year. No graduands received excellent grades in Medicine and Dentistry the same as last year. More than 70% who received distinctionsthis year are females. The percentage differences reflect the total number of student intake.